Deborah Grant scored on a 1-yard run with two minutes remaining in regulation to help Green Valley’s flag football team land an 18-13 road victory over Liberty on Thursday. 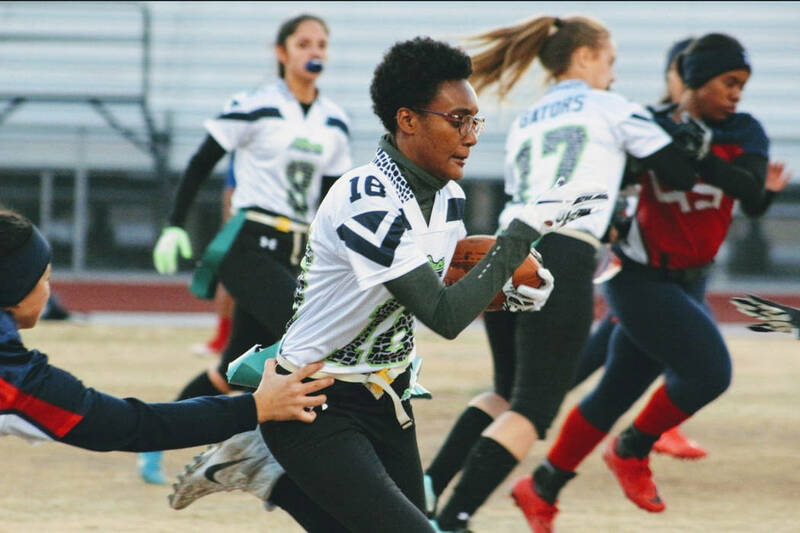 Deborah Grant scored on a 1-yard run with two minutes remaining in the game to help Green Valley’s flag football team land an 18-13 road victory over Liberty on Thursday. Grant finished the game with 163 yards on 20 carries. Hailee McKay scored on an 11-yard run, and Mandolyn Scalise caught a 1-yard touchdown pass from Jennifer Haberstock for the Gators. Jazlyn Camacho, McKay and Rebecca Orozco each had interceptions for Green Valley. Las Vegas 45, Rancho 7 — At Las Vegas, Kaitlyn Horstdaniel threw for 304 yards and six touchdowns as the Wildcats blew out the Rams. Aranza Sepulveda caught six passes for 114 yards and two touchdowns, Tyler Rhoads had three touchdown catches, and Brooklyn Stone caught a touchdown pass for the Wildcats. Brisa Bautista had nine tackles for Las Vegas, who led 39-7 at halftime. Canyon Springs 26, Cheyenne 6 — At Cheyenne, Alexis Mathis rushed for 183 yards and two touchdowns on 21 carries to lift the Pioneers by the Desert Shields. Aniya Hogan added a touchdown run, and Taylor Brown tossed a touchdown pass to Ja’Nasia Spand for Canyon Springs. Coronado 32, Basic 0 — At Basic, Ashtyn Almeido threw three touchdown passes, and Kaylin Hall tossed two touchdown passes to lead the Cougars by the Wolves. Kaylee Zicha caught two touchdown passes, and Sydnee Hansen, Reagan Raimer and Ashley Taibi each hauled in one touchdown for Coronado. Tech 13, Foothill 6 — At Foothill, Taylor Ritayik was 13-for-24 for 128 yards and two touchdowns to help the Roadrunners knock off the Falcons. Adriana Carrillo had five receptions for 43 yards and a touchdown, and Madison Bennett had two catches for 50 yards and a touchdown for the Roadrunners. Whitley Brow had 82 receiving yards and a touchdown for the Falcons, and teammate Niyah King had 10 tackles and an interception. Desert Pines 34, Eldorado 6 — At Desert Pines, Neveah Thompson rushed for 172 yards and two touchdowns and caught a TD pass to lead the Jaguars by the Sundevils.